I have a Honda Hybrid Civic. 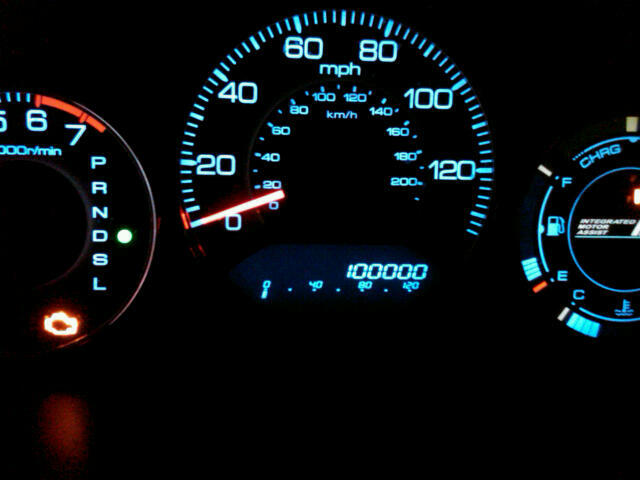 It turned 100,000 miles yesterday! My son documented the event with his camera phone. Now he is going for 200,000, which is less mileage than my brother has on his Honda. This is just a fun blog post – with the message being: photograph the fun things in your life, too! You don’t always have to take yourself and your work so seriously! Well, I guess there is another message: Let’s all pitch in a think about what we can do for the environment. Fun Photography, Honda, Honda Hybrid Civic. Great moment, but isn’t that the check engine light on the bottom left of the photo? Time for a checkup!